I am so thankful that you are here in my site and that I am here to provide you outstanding customer service. Is a priveledge to meet all of you who love and collect molas. Mola Art and craft seeks out for unique traditional handmade mola and mola items by some of the most distinctive Kuna Artisans in the San Blas Islands. By committing to support the Kunas of San Blas, we strive to reinvigorate the appreciation of handcrafted arts and help the Kunas to carry on their culture and traditions. We do not buy molas by the bulk, only by individual pieces and high quality, we buy what they have available, and from other Kuna Artisans that we work with, the Artisans set their own prices and they are paid right away, their beautiful and traditional works is their only way of living. The cost to bring these textiles to the United States is high along with new regulations due to 9/11. If you have never bought/own Molas before, have an interest, curiosity, would you like to become a mola collector? feel free to browse my pages: "Mola Gift Ideas, How molas are made (here you can view pictures of how the Kunas making a mola)". You can also e-mail me your questions: [email protected]. All molas are authentic with traditional motifs and techniques, high quality and has enough fabric around the theme so you can incorporated them into your quilting or craft projects, etc. I am very confident that you will be able to see that "the beauty of this Art speaks for itself". You are invited to browse my Gallery and my site it contains complete information about me, the molas and the Kunas. I love being able to offer you an exquisite, unique and creative piece of artwork at affordable prices and and every month I do offer different promotions (discount) so make sure you take advantage of that. I am sure you will find something you will love to treasure for the years to come. Remember each mola is unique, different, ingenous and attractive. All handmade "no sewing machine", authentic and the perfect and unique gift for your love ones. Working with textiles is my passion and I love to work with all Kuna Artists. Once you buy a mola you will want to come back for more. Take a tour through our galleries just locate the title bar at the top of this page "Mola Gallery" click & Enjoy!! Here in my website you will find the best collection of molas (highest quality) that will last for the years to come. When buying a mola make sure you are paying for superb - high quality, meaning number of layers, stitching being close to invisible, no holes, no dust, no tears or stains, our enviroment is clean, non-smoking and pet free. Our site has change , the first thing you will need to know is that the navigation bar is located at the left starting with MOLA GALLERY if you click there, it will display all the different categories, next you will see a group of categories with specific items: example Mola Eyeglasscases by pointing your mouse there and double click you will enter Mola eyeglasses category and you will be able to see all the items within that specific category. If you want to change the way of looking at the items just scroll to the middle page and you will be able to see the thumbnails. Mola Art and Craft started by Rita C. Smith in 2005 to offer you superb high-quality molas and to educate more customers about our native Kuna Indians, art, culture and traditions. The Molas are top quality, authentic, beautiful reverse applique or applique fabric panels, quilters and crafters all over the world incorporate these beautiful panels in their sewing and craft projects . 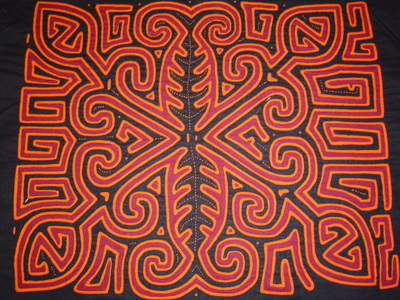 All molas are handmade by the Kunas of San Blas. Many of my contemporary molas has been part of the mola blouse, when the women's do not longer wish to continue wearing that blouse, they remove the mola from the blouse carefully. I guarantee each mola to be Superb quality and in perfect condition. The value of this art increase through the years, they are magnificient piece of art work to own. The items in our gallery are not available in regular stores/online stores, also you may see an item available today, but may not be here tomorrow, because they sell fast. Few people in the USA know about this exquisite indian art and the traditions of the Kuna people. You can inquire about other molitas available in different themes and colors. Once you have find my site, I recommend you to add the link to your favorites, so next time when you want to visit us, you will have the information save on your computer. I know that sometimes it is difficult to find a website that sells art and trust right away, without having more information and enough confidence. Here is how you can buy with confidence from us: You can leave all your worries behind and find what customers are saying about our products under "Feedbacks or Guestbook", also the first thing you should know is that we are part of Artspan.com the largest website for artist, more than 3,000 artist and that Artspan is also top ranked #1 in Google. You can go to www.artspan.com and then go Search (this is on the main bar), then you will see a box under search art, type my name "rita smith" then under choose a category cick on fiber art, locate the arrow that says Go, that should bring up a list of the artist and I should be on the 4th row on that first page. Besides this option, go the main artspan page locate the option Artisans on the main menu bar click there and choose Fiber arts, then type my name on the search art box "rita smith" click on go and that will display the page where I am. We offer a free shipping on all our products within the United States, we have priced all items according to the work and quality on each mola, some are more expensive than others, specially the ones with the triangle cuts, the work is very complicated and time consuming on these molas. Keep in mind that every mola you buy from us will make a big change on the lives of the kuna mola makers, the Kunas deserve to be paid well for all the effort and work that they put into each piece of art, they spent day-night sewing, and that's exactly what we do... paying them well will insured that they will have enough money to solve their needs and their communities can prosper, also one of my best Kuna friends has been working with communities to support their childrens in need and we donate at the end of each year school supplies to support many of the kids, when I travel to Panama I buy all school supplies in the city and then is taken to them, otherwise my mon or sister will make the arrangements to deliver the supplies, recently I start donating fabric, thread, zipper and other supplies to the Kunas it goes to the islands. The Kunas don't have much, but they are thankful for what they have. International Customers welcome, the shipping rate has been set up according, we can always shipp 1-2 molas for the same flat rate $5.50, we do not charge for the handling of the package. If you are in the "art gallery" click on any of the pictures according to the "category" to view all the molas in that specific category. Once there, you will be able to view the slideshow on each category, look to the right of each picture there is drop down arrow click there, it will display a complete list of the categories and remember you have the control arrows below each picture to control the slideshow (forward, backward, the midle one will stop the picture), you will be able to see a larger picture, along with the details on the stitching on each mola. If you received the American Quilters Magazine from AQS be sure to check out my add on page 89 or 92 of the Designer Showcase Issues January Through May 2008. I guarantee each mola on my gallery to be superb quality and authentic. I carefully choose the best handmade molas for my website. Every item we sell is 100% Guaranteed. You will also find shopping easy and safe with Paypal. Our aim is to provide outstanding customer service, so buy with confidence. Teacher(s): When you buy a mola you will receive information on how molas are made and small pattern to teach your students how to make a paper molita, e-mail and let me know you are using the mola in your classroom or request the mola pattern. Add a mola to your craft projects or quilting projects. If you are an art teacher & need to use any picture of any molas you can. The art can't be reproduced by any other individual for sale. The work is the result, or product generated by the mind, intelligence and imagination of its creator. Creator means a natural person who perform an act of intelectual creation, this means the Cuna Women's who sew molas are creators. All the designs and work is solely property of the Kunas of San Blas, Panama. All content in this website, images, text, logos, audio clips, icon buttons, digital downloads, data are property of Mola Art and Craft or its content suppliers and protected by US International Copy Right Laws. All information, pictures and content are property of Mola Art and Craft and can not be copy, transfer or sold in any way without prior written authorization.